Black walnut hardwood floors. Plush four-poster beds. Sunlight streaming through plantation-style shutters. These are the enchanting details you'll find at The Betsy – South Beach. 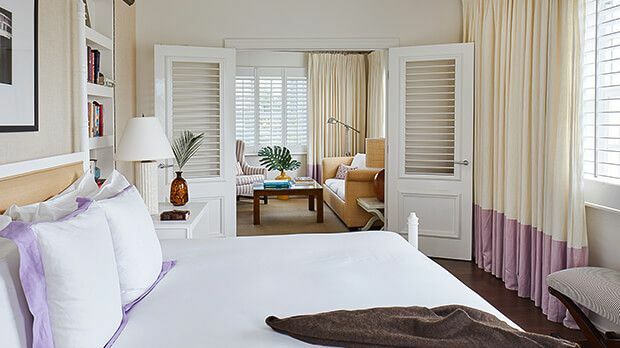 But don't let the old-world style fool you - The Betsy – South Beach was restored with the most modern conveniences in mind. Wireless Internet, mirrors with LCD screens and Bose sound, and precision lighting controls are the bare minimum features of a standard room. Thoughtful touches such as fine Sferra Linens and brilliant orchids round out the sense of luxury. The Betsy – South Beach experience is exactly what you would hope (but be hard-pressed) to find in a hot spot like Miami Beach. If you don't want sand in your suit, you can opt for The Deck, a rooftop sun lounge that offers an unobstructed view of the ocean, the sun, and the stars in the evening, and includes a zen garden and spa treatments for those who really want to unwind. When hunger bites, Chef Laurent Tourondel's iconic modern American steakhouse, BLT Steak, serves up an enticing selection to an exacting, French technique. BLT's RAW Bar also offers an exclusive array of mouth-watering sushi.